Viewing topic "MOTIF XF6,7,8 and SONAR - instrument definition file"
I am looking to find an instrument definition file for MOTIF XF series and Cakewalk Sonar. If there is something else I should be doing in Sonar or on the motif to transport this information please let me know. If any of you have made an instrument definition file can you please email it to me at or post it somewhere so everyone has access to it. This will be really appreciated. Thanks to the John Melas Motif XF Total Librarian I have created an instrument definition file for Motif XF to use with Sonar. This instrument definition file only has the factory default instruments including the factory user bank voices. I hope it helps. can you share your motifxs definitions for sonar with me, please,pretty please? I’m going to try this again and see if the file attaches. 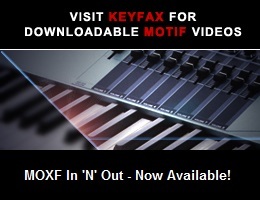 Here is the instrument definition file for motif xf 6,7,8 and Sonar. Hope it helps. Yes finally the file upload works, it is now on the forum. Please download Motif Xf.zip as needed. Thanks so much for this file! This Cakewalk Definitions file for the Motif XF was created in 2011. I’m planning on getting Sonar X3 and it’s almost 2015. Is this file up-to-date for my brand new Motif XF White Anniversary Edition? Thank You. Oh, and by the way, gurbinderamar. Thank you for creating it and offering it here. I can’t imagine going through the effort of calculating the numbers and figuring all of those voices from scratch. But does your file include ALL THE VOICES I have on my new XF Anniversary edition?